Paul Kane’s house at 56 Wellesley Street East, Toronto. Photo taken June 29, 2018. I first learned about the Irish/Canadian artist Paul Kane in the 1950s, in the Native People’s Gallery in the basement of the Royal Ontario Museum (ROM). Compared to the galleries in the ROM today, it was a modest display, but as a young man it created a lasting impression on me. Today, I can still picture the large canoe that occupied a prominent part of the exhibit, as well as the detailed dioramas and numerous paintings of Paul Kane. Because of this experience, I was keenly interested when I read years later that the home of Paul Kane had been identified on Wellesley Street East, a short distance east of the Wellesley Subway Station, on the Yonge Line. Kane was born in Mallow County, Cork, in Ireland in 1810, and arrived in Canada with his family in 1820 at age nine. The Kane family settled in the small colonial capital of York in Upper Canada (Ontario). As a young man, he was employed in Toronto at the Wilson S. Congers factory, painting decorative detailing on furniture. In 1834 he relocated to Cobourg and worked in the same trade at the F. S. Clench’s furniture factory. While in Cobourg, he began painting portraits and after he departed the town in 1836, he earned a modest living as a travelling portrait painter. In 1841, the same year that Upper Canada became Canada West (now Ontario), his ambitions pushed him toward a life-altering decision—to depart for Europe to study art. He remained overseas for almost four years, where he meticulously copied the old masters in Rome, Naples, Florence, Venice and London. His goal was to acquire the skills to allow him to become a professional painter. While in London, he saw the “Wild West Show, ” which included paintings, lectures, and theatrical performances, all staged by the 32-year old artist George Catlin. The show was based on Catlin’s journey in the American west in the 1830s, where he had captured images of 48 different tribes of the American Great Plains. On Kane’s return to Canada in 1844, influenced by George Catlin, he decided to similarly capture through sketching and painting the lifestyle of the native peoples of British North American, and also portray the landscapes of the places where they lived. He believed that the way of life of these peoples was disappearing and wanted to capture it on canvas before it was lost. In the summer of 1845, Kane travelled west as far as Sault Ste. Marie, sketching the Indians he encountered on the way. His aim was to record accurately the life of the Ojibwa tribe, employing the painting style he had learned in Europe. Next he traveled to Fort William (Thunder Bay). The following year, he joined a number of men employed by the Hudson’s Bay Company and travelled further west. He eventually accompanied various groups of voyageurs, journeying as far west as Fort Vancouver on the Pacific coast. During his lengthy journeys, he created sketches in graphite, watercolour and oil on paper. He eventually amassing over 700 sketches, accompanied by detailed hand-written descriptions. When he returned to Toronto two and a half years later, he possessed a considerable collection of sketches that portrayed Indian clothing, artefacts, and customs. From these, he created one hundred large-scale oils on canvas that gave detailed insight into the lives of the native peoples in North America. He also published the daily journal he had written during his trips. It gave the public unique insight into the life of Indians and traders in western Canada. An arranged meeting in Montreal with Sir George Simpson of the Hudson’s Bay Company allowed Kane to receive funding for another expedition. It was to pay for his lodging, meals and other daily expanses while travelling anywhere in the Company lands. Simpson also commissioned a number of sketches of Native American life for his personal collection. Kane set out on his journey in 1846. In 1853, at 44 years of age, Kane married Harriet Clench of Cobourg, the daughter of his former employer. She was an accomplished artist and painting instructor. His travels now over, the same year he and Harriet married, they purchased land that is today 56 Wellesley Street East. They built a cottage, its walls covered with stucco, which was very popular in this decade. Several of his paintings were exhibited to great acclaim at the World Fair of 1855 in Paris. In 1859, he published the highly successful book, “Wanderings of an Artist Among the Indians of North America.” His sketches and journals provided the basis for the book. His financial situation now improved, he enlarged his house during the late-1850s, and in 1879 the facades of the dwelling were covered with pale-yellow bricks. This was likely when the porch was added, containing four slender support-columns. On the porch roof there was a small door that lead to a sitting area on the roof. The Kanes raised four children in the home. To enable his work as an artist, he rented a studio on King Street, but by 1858 his eyesight was failing and he retired. By this time, his style of painting had ceased to be appreciated by the general public and it became difficult for the family to survive financially. In 1871, he died in his home at the age of 61 and was buried in Toronto’s St. James Cemetery on Parliament Street. The house remained in the Kane family until 1903. From 1925 to1973 it became the church hall for The Evangelical Church of the Deaf. The church built a large structure in front of the house that hid it from view from Wellesley Street. In the 1970s, a developer purchased the property and demolished the building that the church had constructed. The Kane House was once more exposed to view. However, it was in such poor condition that many neighbours wanted it demolished. Fortunately, various groups petitioned to have the historic home preserved. In 1978, the City of Toronto purchased the property, valued at $670,000, assisted by the Province of Ontario through funds provided by Wintario. In 1979 it was designated under the Ontario Heritage Act and a parkette was established on the south side of the home, where the building had been that the church had erected. The small park was where the front lawn of the Kane family house had been. The house remains today is officially an historic site. In 1985 the architect Paul Reuber incorporated the house into a new co-op housing development. Only the structurally sound portion of the house were included, as the rear of the original house was in very bad shape, having been damaged by fire. Today, strolling along Wellesley Street East, the Paul Kane house provides a pleasant contrast to the many modern structures that surround it. I cannot but wonder how Kane would have felt if he knew that his home is now located in the heart of the Gay Village. A man named Howard, who watched me photograph the dwelling, informed me that during Pride 2018, the park contained many tents for various activities and enterprises. Howard said that no one was aware who Paul Kane was or that his home was on the north side of the park. The home of Paul Kane at 56 Wellesley Street, the photo taken pre-1879 as its walls remain covered with stucco (hardened plaster used for coating outdoor walls). When the photo was taken, Wellesley Street had not been widened and there was a grass boulevard between the sidewalk and the street. When the house was built in 1853, the street was north of the city in a semi-rural setting. However, it was an ideal place to live as four years earlier a horse-drawn Omnibus Line (streetcar) had opened on Yonge Street that connected the St. Lawrence Market to the town of Yorkville, north of Bloor Street. The Kane home was only a few steps east of the line. Photo from the Toronto Public Library, 0058865f. Photo of the home in 1975, after the building that had hidden it from being viewed from Wellesley Street had been demolished. The high-rise apartment behind the house is 41 Dundonald Street, which is one block north of Wellesley. Toronto Public Library, 0058865f. Photo taken looking north from Wellesley Street in 1976. Toronto Archives, S 1465, S 10616, it 0007. The house in 1978, Anne Englebright sketching the historic property. Toronto Public Library, 0103822. View of the Paul Kane home in 1984. Toronto Public Library, 011303. Children in the park in 1984. Toronto Public Library, 0113029. Paul Kane house is today surrounded by residential towers and ongoing construction in ever-expanding Toronto. South and east facades of the Kane home. On the east facade there are bay windows on the first and second-floor levels. It is likely that behind the bay windows were the dining room on the first floor, and the main bedroom on the second floor level. They were situated so that the rooms were exposed to the morning light. The porch over the doorway on the south facade. The porch of the home has four slender support columns, facing south toward Wellesley Street. The door has sidelight windows on either side and a transom window on top. The windows allow daylight to enter the central hallway. View of the doorway of the home of Paul Kane. The scenes below were painted in 1846 on Paul Kane’s trip from Fort William to the Pacific coast. All the paintings are in the Canadiana Gallery of the Art Gallery of Ontario (AGO). Callum Indian Travelling lodges, oil on paper, mounted on canvas. Drying Salmon at the Dullas River, Columbia, oil on paper, mounted on canvas. Below the Cascades, Columbia River with Indians Fishing, oil on paperboard. Indians Salmon Fishing, Kettle Falls, oil on paperboard. Scene in Northwest—Portrait, oil on canvas. Landscape in the Foothills with Buffalo Resting, oil on paperboard. At Buffalo Pound, oil on paperboard. Metis Running Buffalo, oil on paperboard. Metis Encampment, oil on paper mounted on canvas. “ Lost Toronto”—employing detailed archival photographs, this recaptures the city’s lost theatres, sporting venues, bars, restaurants and shops. This richly illustrated book brings some of Toronto’s most remarkable buildings and much-loved venues back to life. From the loss of John Strachan’s Bishop’s Palace in 1890 to the scrapping of the S. S. Cayuga in 1960 and the closure of the HMV Superstore in 2017, these pages cover more than 150 years of the city’s built heritage to reveal a Toronto that once was. 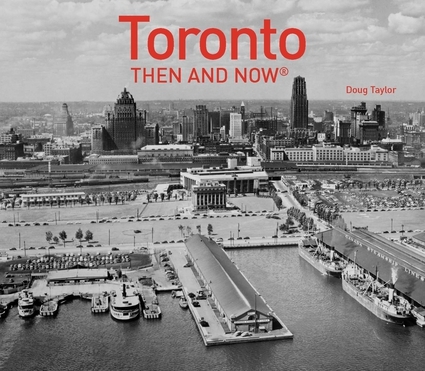 “Toronto’s Movie Theatres of Yesteryear—Brought Back to Thrill You Again” explores 81 theatres. It contains over 125 archival photographs, with interesting anecdotes about these grand old theatres and their fascinating histories. Note: an article on this book was published in Toronto Life Magazine, October 2016 issue.